Industrial Relations (IR) usually refer to relationships between labour and capital that grow out of employment. There are two parties in the ‘employment’ relationship-labour and management. Both parties need to work in a spirit of cooperation, adjustment, and accommodation. In their own mutual interest certain rules for co-existence are framed and adhered to. Opinions about IR in Japan are extremely diversified. The main concern regarding IR appears to be whether Japan can maintain the vitality and flexibility to cope with the changes in the industrial structure and technology in a stagnant world economy. The lack of opposition and dispute between labour and management may be the most important feature for summarizing labour-management relations in modern Japan when making international comparisons. The study highlights IR and points out lessons that Bangladesh can take from Japanese perspectives. The research is based on desk study. Moreover, the recommendation would be helpful to the practitioners, researchers, planners, policy makers and academicians, who are involved in the concerned area. IR is also concerned with determination of wages and conditions of employment. IR and human relations are distinctly two indispensable factors in industry, one depending on the other. We can have good industrial relations in an industry, but bad human relations in the same establishment and vice versa. Good industrial relations provide the necessary background for human relations. In any undertaking, good relations between the management and workers depend upon the degree of mutual confidence which can be established. This, in turn, depends upon the recognition by the employees of the goodwill and integrity of the management in the day-to-day handling of questions, which are of mutual concern. The first requisite for the development of good industrial relations is a good labour policy. The aim of such a policy should be to secure the best possible co-operation of the employees. Every employee should have the opportunity to contribute not only his services, but also his suggestions and ideas towards the common effort. The basic needs of an industrial worker are freedom from fear, security of employment and freedom from want. Adequate food, better health, clothing and housing are human requirements. The human heart harbors secret pride and invariably responds to courtesy and kindness just as it revolts to tyranny and fear. An environment where he is contented with his job, assured of a bright future, and provided with his basic needs in life means an atmosphere of good IR. IR has several roles in the industrial development in any country; two fold objectives of good industrial relations are to preserve industrial peace and to secure industrial-operations. If we have to establish industrial peace, the workers must be assured of fair wages, good conditions of work, responsible working, holidays and minimum facilities of life. The objectives of good industrial relations should be the development and progress of industry through democratic methods, stability, total well-being and happiness of the workers, and industrial peace. Hence, industrial peace is the fruit of good industrial relations. increased to 4825 in 20081. Average growth rate of this sector was over 20% per over the last two decades. This single sector alone earns about 80% of yearly foreign exchange of the country. Its contribution to GDP reaches 13% in fiscal year 2009-2010. Since independence, no single sector could accelerate the industrialization process in the country as the RMG sector could do. It has created employment opportunity for about 3.5 million people. Most of them are uneducated and unskilled. About 80% of them are women. To a creditable extent, it has been able to relieve the country from the burden of unemployment and at the same time contribute to the empowerment of women. Thus this sector is playing a vital role in socioeconomic development of the country. amount of revenue from this sector. Buyers, who get garment products at the cheapest possible price, make huge profits in international markets. Most of the local factory owners make adequate money out of this business to build palatial houses in posh area of capital, have their children educated and treated abroad, ride luxury cars, spend holidays at tourist resorts across the world. But garment workers, who make all these profits and benefits possible for other three parties, are to live a sub-standard life for years. The wage they get is low. Very often they do not get their salary, overtime bills and bonus in time. Their recruitment system is hiring and firing as they do not get any appointment letter and at any time they can be dismissed by owners for any reason. Being maltreated by owners and midlevel officers, working long hours in a congested room without sufficient rest, lack of recreational opportunity, nutritious foods, medicine, right to legitimate protest against ruthless exploitations, etc are their daily destiny. They don’t have any access to the decision making process. Factory building collapse, fire accident, stampede render many dead and 2 A Latin sentence reportedly written by Julius Caesar in 47 BC meaning easy triumph 3 injured. Nevertheless, if any worker protests against owners or management, he/she is threatened by various types of harassment such as dismissal, arrest or even physical assault by the hired hooligans of owners. There are allegations that a vested group is behind the violence in garments industry. Some Human-right-based NGOs are alleged to instigate the work-force in the name of their rights and privileges without knowing the actual capacity of the owners. Very often, agitating workers are aided by outsiders. Nowhere in the world is labor as cheap as in Bangladesh. It is one of the main factors for flourishing of this sector in Bangladesh. Therefore, foreign conspiracies in instigating labor unrest in garment sector of Bangladesh cannot be ruled out as history records hundreds of wars to capture another market. At every incidence of labor unrest, police is deployed to disperse agitators. The coercive measures of the forces rather deteriorate the situation. Concerned groups engage themselves in blame game and do not waste time to put their readymade comments. Party in power always takes it as a subversive act of opposition party to destabilize government. Opposition party labels it as a failure of government and demands resignation. Factory owners blame workers and vice-versa. Very often, after some violent unrest, an inquiry committee is formed to look into the fact. But the fact is that, hardly people come across the investigation report. After some days people forget the issue and things go on as usual. Solving labor unrest in the RMG sector requires a collective effort. The root causes of unrest are to be explored. If private sectors (garment factory owners, managers, workers, BGMEA, workers’ association, members of civil society organizations, NGO activists) with their firsthand knowledge and experience work together with the public bodies, solution of this problem is possible. Link with the research questions: The causes of labor unrest in the RMG sector of Bangladesh have been explored. Irregularities in payment, low wage, mistreatment of the workers by managers/ officers, rumor, absence of trade unionism, conspiracy, non-execution of labor laws, unruly nature of the workers and political intervention have been found to the major causes of labor unrest. The prospect of public-private cooperation in addressing labor unrest in the RMG sector is validated. Majority of the respondents emphasized cooperation of public and private sectors in four areas such as maintaining law and order situation, investigating the incidents of labor unrest, bridging gap between the owners and workers and involving the work-force in the decision-making process in attempt to solve the problem. 100% respondents emphasize the importance of investigation of the incidents of labor unrest occurred in the RMG sector. Majority of the respondents (44%) like to assign tripartite committee (a committee formed by the representatives of Government, owners and workers) the task of investigating the incidents of labor unrest which indicates a bright prospect of PPP approach in this issue. To improve the performance of industrial police, 62% respondents suggest for improving manpower and logistic support of the force while 38% respondents opine for inclusion of intelligence unit in it. Half of the respondents admit that there is a communication gap between the owners and workers. Majority of the respondents choose tripartite committee to act to bridge the gap between the owners and workers which further unfolds the scope of PPP in this issue. Most of the respondents (70%) think that the work- force has no access to the decision-making process. 92% of the respondents are of the view that if the representatives of the work-force are involved in the decision-making process both at inside the factory and at national level, the chance of labor unrest will be diminished. Regularization of workers’ wage structure and its proper implementation, exemplary punishment for the defaulters, investigating the incidents of labor unrest and following up the report, enhancing co-operation between public and private sector, monitoring the working environment of the RMG factory regularly, appointing “Grievance Officer” in the factories and involving the work-force in the decisionmaking process are the major recommendations by the respondents for addressing labor unrest in the RMG industry of Bangladesh. Primary data collected from questionnaire and interview methods have been cross-checked with secondary data collected from content analysis. In most cases, data collected from primary source match with those of secondary source. However, two statements collected while interviewing a garment factory owner and a manager directly contradict with the secondary data which has attracted the concentration of the researcher. i) One of the factory owners from Dhaka says, low wage of the garment workers is justified. He argues, after the phase-out of MFA in 31 Dec 2004, Bangladesh is competing with the other garment exporters in a level playing field. Many apprehended that RMG sector of Bangladesh will not be able to absorb the shock. But this apprehension proved to be invalid as growth and export of RMG sector of Bangladesh is continuing at its progressing pace. He asks, why foreign buyers prefer Bangladesh to China, India, Sri Lanka, Cambodia, Vietnam, and Mexico? Because, Bangladesh can provide quality garment in comparatively low price. It is possible because production cost of RMG is comparatively low. It is possible because Bangladesh can recruit garment workers at comparatively low wage. Most of the garment workers are unskilled and uneducated. Their physical ability is their main capital and they are willing to work at this low wage as they have no other option. The remark though seems to be harsh bears some truth. But it cannot be universally accepted as it constitutes only 2% of the total responses. ii) One of the managers from a garment factory of Dhaka negates the statement that workers are mistreated by the managers. In the face of country-wide labor unrest in the RMG sector of Bangladesh in 2009 and 2010, he says, rather the management of garment factory is afraid of workers as they are huge in number, united, organized and unruly in nature in demanding their privileges. Very often they do not consider the capacity of the factory owners. His remark deserves attention as 30% respondents consider unruly behavior of the workers as one of the causes of labor unrest. Most of the garment factories of Bangladesh are located in Dhaka and adjacent towns of Dhaka like Savar, Ashulia, Tongi, Gazipur and Narayangang. Some are located in Chittagong. As regard labor unrest or owners-workers relations, all garment factories share some common problems. For the convenience of primary data collection, factories of Dhaka, Savar and Gazipur have been visited. Research design provides a framework to the researcher to navigate the journey in the field and finally execute the study. The nature of the problem to be studied and research questions to be answered which are the guiding pillars to decide what approach and strategy would be employed to pursue a research. According to Creswell (2003) research design fall into three categories: a. Quantitative b. Qualitative and c. Mixed method. The present study utilizes a mixed method approach. The qualitative approach is used as a predominant method because the research is conducted in its natural setting where the quantitative method will be used to analyze the data. s.
Both primary and secondary sources of data have been used. Primary data have been collected through interview and questionnaire methods. Secondary data have been collected from different relevant publications, dissertations, books, journals, newspaper articles and reports, government publications, rules, acts, websites etc. Collected data have been validated through cross-checking with the responses of the various respondents. Primary data collected through questionnaire and interview have been compared with secondary data. Simple arithmetic calculation has been used to analyze data. 18 Data have been presented through computer generated graphs, charts and tables using Microsoft Office tools..
A semi-structured questionnaire carrying 20 questions has been developed for the garment workers. The questions are grouped in some clusters such as causes of labor unrest, conspiracy, importance of investigation, law and order situation, involving the work-force in decision-making process etc. Besides, 20 respondents comprising of representatives from civil society organizations, factory owners, managers/officers, political leaders, government 42 officials, representatives of BGMEA, member of law enforcing agency are interviewed on the same issues. Data collected from both questionnaire and interview are combined for analysis. A mixed (qualitative + quantitative) method is followed to analyze the data. However, no. of respondents varies from question to question. The Readymade Garment (RMG) industry of Bangladesh has emerged as a competent garment producer in global garment business in recent times. This industry has successfully transformed Bangladesh into an export-oriented economy. The RMG industry also became the major foreign currency-earning sector with highest rates of absorption of industrial employment. Interestingly, women comprise more than 80 per cent of the total labour force and most of them could be otherwise destitute or empty handed. In a patriarchal society like Bangladesh, the RMG industry effectively challenged the traditional view of conflating domesticity with femininity by allowing women of low-income backgrounds to move from the household to the labour market. Garment trade is regarded as a leading driver of globalisation. Though garment workers gain much by working in the garment industry the informal nature of job and adverse working conditions often threaten the livelihood possibilities of workers. This study focuses on the labour rights implementation in Rupa Group Pvt. Ltd. It is assumed that labour rights safeguarded workers form negative consequences. It is also evident that labour rights increase labour productivity. Theoretically there are opportunities to establish labour rights within this organization but in practice the picture is simply unsatisfactory. The recent labour unrest in Bangladesh is the outcome of longstanding violation of labour rights in the organizations like this. Labour rights can be ensured if Bangladesh Government can formulate and implement a comprehensive and effective labour law that incorporates labour rights in the RMG industry. The existing business model favoured headquartered interests and largely overlooks labourers‟ interests especially in developing countries. The organizations such as ILO, WTO, which are supposed to protect labourers from insecurity, vulnerability and injustice, are somehow problematic in relation to the implementation of labour rights in Least Developed countries such as Bangladesh which came into this very business by dint of its cheaper labour. The RMG industry is the lifeline of Bangladesh economy and it has the potentialities to reduce poverty to a large extent by gaining increasing share in the world apparel market. Implementation of labour rights can ensure sustainable livelihood of the garment workers, which in turn enhances sustainability of the RMG industry. It will not be a hyperbole to say that economy of Bangladesh is what it is today mainly because of readymade garment industry. A population of around 160 million for a small country like Bangladesh, in all probability, is considered a serious liability. However, with the inception and subsequent exponential growth of RMG sector, it has turned that liability into an invaluable asset. In the post-liberation economy of Bangladesh, this sector has acted as an engine of growth for the rest of the economy. Even in the face of recent global economic recession, economy of Bangladesh is not shaken mainly because of steady growth of this sector and smooth flow of remittance. Quota-based access to EU and USA and other countries under MFA, local demand, cheap labor, low production cost and private entrepreneurship have been the contributing factors for evolution of RMG sector in Bangladesh. Accelerating industrialization process in the country, attracting foreign direct investment, alleviating poverty through creating employment opportunities for millions, mobilizing business, empowering women and creating a positive image of Bangladesh abroad are major contributions of this sector. However, this sector is enmeshed with a number of problems and challenges such as conflict between factory owners and garment workers, labor unrest, conspiracy of home and abroad, non-compliance, shortage of gas and electricity, poor infrastructure, political interference, regional and international advancing competitors, lack of effective government policies, and lack of initiatives to search international markets etc. This chapter discusses history of growth of RMG sector in Bangladesh, factors promoting the growth of RMG industry in Bangladesh, contribution of this sector to national economy, RMG industry in quota-free post-MFA era and problems surrounding this sector. Factors which promoted growth of RMG sector in Bangladesh can be categorized into two groups- 1) domestic and 2) external. RMG is a labor-intensive sector. Bangladesh is an over-populated country burdened with unemployment problem. The private entrepreneurs in the late 1970s and early 1980s got an opportunity to use cheap labor to flourish this sector over-night. At present, about 3.5 million people are working in this sector. About 80% of them are women. They got a chance to change their fate by working in the garment factories which helped boom the sector. Nowhere in the world is labor as cheap as it is in Bangladesh. The following table shows a comparative study of per hour labor wage in major RMG exporting countries. Low production cost: As labor cost is very low, RMG factories in Bangladesh can produce quality garment at lower cost which has attracted the foreign buyers. International companies like Wal-Mart, JC Penney, H&M, Zara, Tesco, Carrefour, Gap, Metro, Marks & Spencer, Kohl’s, Levi Strauss and Tommy Hilfiger all import in bulk from Bangladesh. The total export from the sector has doubled from $6.4 billion in FY 04-05 to $12.5 billion in FY09-10. The comparative advantage of low production cost also attracted foreign direct investment. As a result, both backward and forward linkage industry flourished in Bangladesh. Currently, the backward industry is able to meet up to 85% of the demand for the raw materials, which significantly contributed to the country’s growth of apparel and knitwear exports. 28 production and export. Surpassing all these, labor unrest has become a chronic disease in this sector. At present, labor unrest has been labeled as a conflict of interest between the owners and workers. Generally labor unrest emerges when workers come to the street demanding some facilities (financial or other) which the owners are not ready to provide. Sometimes some rumors spread unrest among the labors. Conspiracy of home and abroad is also responsible. Sometimes it is found that workers of a factory attack intentionally another factory to damage the factory or hampers its growth as there is competition among the factories. Some NGOs financed by foreign donors are blamed to instigate the garment labors regarding their rights and privileges. The actual causes of labor unrest must be addressed and proper action must be taken to solve this problem. Government, owners and workers have to work hand to hand to come out the situation. sub-standard life in city slums for years. The wage they get is low. Very often they do not get their salary, overtime bills and bonus in time. Their recruitment system is hiring and firing as they do not get any appointment letter and identity card of the factory and at any time they can be dismissed by owners for any reason. They don’t know anything about their job contract. Being maltreated by owners and mid-level officers, working long hours in congested environment without sufficient rest, lack of nutritious foods, medicine, right to legitimate protest against ruthless exploitations etc are their daily destiny. They don’t have any access to the decision making process. Factory building collapse, fire accident, stampede render many dead and injured. Nevertheless, if any worker protests against owners or management, he/she is threatened by various types of harassment such as dismissal, arrest or 11 Source: The Quarterly Wheel, Oct‐Dec 2010 32 even physical assault by the hired hooligans of owners. Common causes of labor unrest in the RMG sector in Bangladesh are discussed briefly below. Most of the labor force of this sector are uneducated and unskilled and have come from rural area simply in search of livelihood. They have to work hard in return for a very poor salary. The detailed 4th wage structure for the garment workers is shown in the following table. The board recommended the minimum wages in light of 10 issues — cost of living, living standards, production cost, productivity, cost of the goods produced, inflation rate, job pattern and associated risks, business capacity, socio-economic condition of the specific industrial sector and the country as well as other relevant issues. The minimum wage board asked for and gathered views of various social stakeholders on the impact of inflation from the Bangladesh Bank (BB), Bangladesh Institute of Development Studies (BIDS), Bangladesh Bureau of Statistics (BBS), Centre for Policy Dialogue (CPD), Bangladesh Institute of Labor Studies (BILS), Consumer Association of Bangladesh (CAB) and others. It has also asked for a report on the nutritional requirements of the apparel workers from the Institute of Food and Nutrition of the University of Dhaka, Sramik Karmachari Oikya Parishad (SKOP) and other garment worker’s association. While government institutions, like the BB, BIDS and BBS, reported that since 2006, the cost of living increased by at least 35 per cent, the private think-tank, CPD reported that the average cost of living has risen by around 70 per cent. CAB reported that the average cost of selected food items and other major utilities, consumed by workers, had increased by 53 per cent on an average. ‘The minimum wage fixed for a worker is not enough to live a standard life when compared with the high cost of living,’ says Razekuzzaman Ratan, general secretary of Samjtantrik Sramik Front. According to him, a garment worker needs about 3,030 calories a day, accounting for a daily amount of Tk. 64.50. ‘Thus a person will need about Tk. 1,935 a month and to maintain a four member family, Tk. 7,740 would have to be spent on food alone. After adding utilities, house rent, transport cost, medicine and outfits, the total amount will stand at about Tk. 14,240 a month. If two members of a family are RMG workers, we believe that the minimum wage should be Tk. 7,120 per person,’ opines Ratan. On the other hand, according to the BILS survey, the minimum wage for a single worker has to be Tk. 5,277 amounting to Tk. 8,452 for a four member family to live a standard life. The minimum wage for workers of RMG sector, in any account, is very low in the face of ever-increasing prices of daily necessaries. The following table shows a comparative study of minimum wage of workers of RMG sector with other industries of Bangladesh. Sl. No. Sector Minimum wage in Tk. factories are found not implementing the new scale under various excuses. There is severe warning from government; yet many factories found to be going on their own way. Sometimes, deferred payment of salary, bonus and overtime bill spread unrest among labors. Rumor plays a crucial role in swelling unrest among the labors. ‘Bonus will not be given before Eid’ / ‘A worker is beaten by the manager’ / ‘A labor leader is arrested’ – these types of rumors ignite the workers and without knowing the fact, the workers sometimes come to the street and involve in vandalism and rampage. Sudden closure of a factory without prior notice to the workers which poses uncertainty and fear of losing job among the workers works as a source of unrest. The coercive role of law-enforcing agencies angers the labors. A common picture in time of unrest is that the deployed police charge the workers and the agitating workers reiterate causing injuries to both side. Filing cases or arresting the agitating workers is a common means to subdue the workers. Nevertheless, the law enforcing agencies are often found to play a biased role against the workers. As the owners are rich and influential, there is hardly any instance of their arrest or police’s taking case against them by the workers. Theory of conspiracy regarding labor unrest cannot be ruled out. There may be two types of conspiracy- 1) domestic and 2) external. There exists competition among the factories. The owners or management of a factory may instigate the workforce of its rival factory with some misinformation which results in unrest and disorder in that factory. Hamper of production of a factory as a result of labor unrest may benefit its competitor. Some NGOs financed by foreign donors are blamed to instigating the workers in the name of working for the improvement of workers’ condition. This may be a blue print of some regional competitors of Bangladesh in RMG business. If the RMG sector of Bangladesh can be paralyzed causing labor unrest, foreign investors and buyers divert to another country. catastrophic. All the four parties- the workers, the owners, government and foreign buyers will be affected. If labor unrest continues, the foreign buyers will cancel their orders and divert to other exporters like, India, China or Cambodia. Hundreds of factories will be closed. Many owners may be bankrupt. Labors, losing jobs will lose their livelihood and many will involved in criminal activities. This will create burden on the existing unemployment problem and increase various types of crimes in the country. The government will be deprived of huge foreign exchange and revenue income. The industrialization process of the country will be impeded. The foreign buyers, who could buy quality garments at a low price and make huge profit in the US or EU market will have to eye on another exporter country from where they have to count a high price for the same garments. Hundreds of businesses, grown based on RMG industry, will suffer. The whole economy of Bangladesh will be adversely affected. To find out the causes of labor unrest is one of the two objectives of the study. Accordingly, the first question to the respondents was about causes of labor unrest in the RMG sector of Bangladesh. In response to this question, the respondents express different views. The following bar chart ranks various causes of labor unrest as perceived by the respondents. Out of 50 respondents, 78% take irregularities in payment as one of the prime causes of labor unrest. Irregularities covers delay in payment of salary and bonus (a policy followed by the factory owners and managers to hold them in their factory and have control over the workers), cutting salary for causal leaves or late attendance; dilly-dally in executing of new wage scale etc. Payment of salary is a vital issue for the workers. Many things of their lifecycle depend upon it. One of the interviewees observes, if it is delayed or disturbed, it badly troubles their family life which pushes its wave to the factory and production. 74% respondents think low wage of the workers is the cause of labor unrest. 66% respondents think mistreatment of the workers by the managers/ officers forces the workers to go the street. 60% think rumor works as an agitating factor among the workers. 50% think absence of trade unionism, 44% think conspiracy, 34% think non-execution of labor laws (national and international), 30% think unruly nature of the workers and 24% consider political intervention as causes of labor unrest in the readymade garment sector of Bangladesh. Response Respondents Percentage Yes 28 56% No 10 20%. Out of 50 respondents, 56% believe that there is conspiracy behind labor unrest, 20% rule out the theory of conspiracy while 24% don’t know anything about the matter and all of them fall in workers group. It reveals that most of the garment workers don’t think deeply other than their salary and work. In response to the question of type of conspiracy, out of 28 respondents, 50% eye other country’s intrigue in this sector, 25% consider some NGOs’ instigation and 25% blame evil designs of some mid-level officers of the factories. [n – 28] Types of conspiracy as perceived by the respondents. A-Other country’s intrigue B-Some NGOs’ instigation C-Evil design of some mid-level officers Though Bangladesh is a small and poor country, it has done excellent in exporting RMG in many countries of the world. It has been possible mainly due to the availability of cheap labor in the country. Bangladesh has defeated many regional countries in this sector. It has been a matter of envy for many competitors of Bangladesh. Half of the respondents consider labor unrest in RMG sector of Bangladesh as creation of those countries. If the RMG sector of Bangladesh can be trouble-torn by labor unrest, foreign buyers will lose their interest here and divert to other exporting countries. 25% respondents allege that some NGOs funded by the foreign donors and working for human rights, labor rights, gender issues and health facility are responsible for instigating the labor-force. They don’t know the ability of the owners and profit of the factory. They only excite the workers to exert pressure on the owners and management of the factory. 25% respondents consider the labor unrest as a product of evil design of the mid-level officers of the factories. For their personal interest they make a gap between the owners and workers and present fabricated report to the two parties and thus worsen the situation. As a measure of preventing conspiracy in the RMG sector, 75% opine for proper investigation while 25% suggest for close monitoring of the activities of the alleged NGOs. Do you think that the incidents of labor unrest should be investigated? 100% respondents emphasize the importance of investigation of the incidents of labor unrest occurred in the RMG sector. But to the query by whom the incidents should be investigated, the respondents divide in opinion. Out of 50 respondents, 44% suggest for tripartite committee (a committee formed by the representatives of Government, owners and workers), 30% suggest for government, 10% think some civil society organization and 8% consider BGMEA to be assigned with the task of investigating the incidents of labor unrest. 8% left the question unanswered. The following pie chart shows the choices of the respondents for the task. The pie chart shows that majority of the respondents (44%) like to assign tripartite committee the task of investigating the incidents of labor unrest which indicates a bright prospect of PPP approach in this issue. Out of 38 respondents, 53% admitted that there had been incidents of labor unrest recently in their factory while 47% answered that there had been no incidence of labor unrest in their factories. It means that more than half of the garment factories which are visited for data collection are affected by labor unrest recently. [n -20] Response Respondents Percentage. For fixation of minimum wage for the garment workers 14 70% What were the reasons of the labor unrest in your factory? For implementation of newly declared wage scale 06 30% Responses about causes of recent labor unrest. Out of 20 respondents, 70% termed fixation of minimum wage for the garment workers as ground for labor unrest while 30% answered that the reason behind the labor unrest had been workers’ agitation for implementation of new wage structure which was declared on July 2010. Had there been any retrenchment after the incident of labor unrest? No 16 80% Responses about retrenchment after labor unrest Closing of the affected garment factories and retrenchment of a number of labors has been a common phenomenon in RMG industry in Bangladesh. But here only 20% respondents of the affected factories told that there had been retrenchment after the incident of labor unrest. Had there been any investigation after the incident of labor unrest? No 20 100% Responses about investigation after labor unrest 100% respondents informed that no investigation was conducted after the incident of labor unrest. It reveals that the issue though felt important is being neglected. However, 6 respondents told that there were discussions among the factory owners, managers and workers after the incidents of labor unrest. To maintain law and order in industrial area, operation of a new branch of police department namely Industrial Police has been launched. But it is very new and suffering from acute shortage of manpower and logistic support. At present it is working in a handful industrial areas which are prone to labor unrest. The respondents were asked about performance of Industrial Police. The following pie-chart shows the responses about performance of Industrial Police. Performance of the Industrial Police. Out of 50 respondents, 32% are satisfied with the performance of industrial police, 28% termed it as mediocre, 16% are not satisfied with it while 24% have not put any comment. To a sequel question how to improve the performance of industrial police, 62% suggest for improving manpower and logistic support of the force while 38% opine for inclusion of intelligence unit in it. Perception regarding owner-worker relations Half of the respondents admit that there is a communication gap between the owners and workers. However, 30% of the respondents rule out the issue while 20% have left the question unanswered. In response to a link question, who is to negotiate between the workers and owners, out of 25 respondents, 48% assigned the task with tripartite committee, 40% chose for government while 12% assigned the task with BGMEA. Again, scope of PPP approach in addressing labor unrest is emphasized. Most of the respondents (70%) think that the work- force has no representation in the decision-making process while only 30% are not agreed with them. 92% of the respondents are of the view that if the representation of the work-force is included in the decision-making process, the chance of labor unrest will be diminished while 08% of the respondents opposed the view and argued that representation of the work-force in the decision –making process would deteriorate the situation. In response to a sequel question how the work-force can be represented in the decisionmaking process, the respondents expressed different views. Out of 46 respondents, 33 suggest that representatives of the work-force should be included in the regular meeting of the factory, 7 opine for forming committees with the representatives of workers, managers and owners of a factory while 6 demand the right of forming workers’ association which can bargain with the owners or BGMEA or even with government. Finally, the respondents were asked to suggest how to address labor unrest in the RMG sector of Bangladesh. The following bar chart ranks the observations of the respondents for the issue. G- Inclusion of representatives of labor-force in the decision-making process 84% of the respondents suggest that the wage structure for the garment workers should be regularized and implemented properly, 74% respondents are of the view that the defaulters should be awarded exemplary punishment, 70% emphasize investigating the incidents of labor unrest and following up the report, 66% suggest for enhancing trust, communication and co-operation between public and private sector, 60% prioritize monitoring the working environment of the RMG factory regularly, 54% feel the importance of appointing 55 “Grievance Officer” in the factories and 50% says that representatives of the work-force should be included in the decision-making process. In respect of production, export, earning foreign exchange, contribution to GDP, employment, investment and business mobilization, RMG sector of Bangladesh has been a flourishing industry. Its importance has crossed geographical boundary of the country. Garment business of many international markets in Europe and North America depends on production of garment factories of Bangladesh. It involves stakeholders from various corners covering public, private and international organizations. Given the fabulous volume of trade of the industry, the increasing trends of labor unrest in the RMG sector has been a matter of serious concern. Solving labor unrest in this sector is nearly impossible by a single agency like government or BGMEA or a civil society organization. Findings from data analysis show that public-private cooperation is the most chosen way of addressing labor unrest in the RMG sector of Bangladesh. The objectives of this present study are to find out the causes of labor unrest and identify areas where public and private agencies can work to address the issue. The responses of the respondents unfold that irregularities in payment, low wage, mistreatment of the workers by managers/ officers, rumor, absence of trade unionism, conspiracy, non-execution of labor laws, unruly nature of the workers and political intervention are the major causes of labor unrest in the RMG sector of Bangladesh. The causes are to be diagnosed through investigation. Findings of the study suggest that investigating the incidents of labor unrest and following up the recommendations is an important attempt to solve the problem. For investigation, most of the respondents like to assign the task with tripartite committee (a committee formed by taking representatives of factory owners, government and garment workers) which emphasizes the need of cooperation between public and private organizations in this issue. For a flourishing industry like RMG, maintaining law and order situation in the industrial area is very important. During labor uprising, it was found that unidentified outsiders entered the factory area and participated in violence in the name of workers. To control the situation sometimes law enforcers use to rely on coercive measures and disperse the agitating workers. However, it often deteriorates the situation. There is another allegation maintained by the garment workers against the law enforcers that latter work in favor of the garment owners and against the workers. To ensure sound law and order situation, co-operation between the conflicting parties is a crying need. The law enforcers, with all impartially can help trace the culprits into book and award exemplary punishment. On the hand, the factory owners, managers and garment workers have to have full support to them, provide genuine information to them and help in time of investigation. To avert further unrest, intelligence agency can work in the garment industry area. Factory owners and garment workers are two most vital actors in RMG sector. They are complementary to each other. 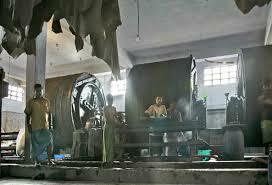 The strength of the factory owners is that they are rich, organized and influential in the society. On the other hand, the huge number and unity of the garment workers are their power. Good relationship between the workers and owners is essential for the production as well as boost of the industry. Majority of the respondents (70%) perceive that there exists a communication gap between the owners and workers of garment factories. ‘Tripartite committee’ is preferred by 48% respondents to bridge the gap between the owners and workers. Involving labor-force in decision-making process is important in addressing labor unrest in the readymade garment industry. It is perceived by 92% of the respondents. While exploring the causes of labor unrest, it is found that irregularities in payment and low wage rank top among the causes of labor unrest. When this thesis is taken in hand, it was time for declaring new wage scale for the garment workers. There was tough bargaining between the factory owners and labor-leaders for the fixation of minimum wage. The labor-leaders demanded the minimum wage to be fixed at Tk. 5000 while the factory owners started it with TK. 2000. After a series of meetings with factory owners, Minimum Wage Board and labor-leaders finally it was settled at TK. 3000. Participation of all stakeholders in the decision-making process really helped settle the dispute. Respondents are of the view that representatives of labor-force should be included in regular meetings inside the factory as well as decisionmaking process at national level. They are also to be included in various committees with the factory owners and managers. Finally, it can be concluded that public-private cooperation in addressing labor unrest in the RMG sector of Bangladesh can be a viable and effective measure. However, level of mutual trust, communication and co-operation between workers and management of a garment factory as well as public and private sector should be uplifted. Minimum wage for the garment workers should be regularized and implemented properly. The labor-force needs to shun the path of violence and vandalism. Rather, they can place their rightful demands to the respective authority. The factory owners can hear and address the problems of the labor-force. A ‘Grievance Officer’ in all garment factories can be appointed. Incidents of labor unrest need to be investigated taking stakeholders from all concerned sector. Recommendations of investigation report need to be implemented properly. The real defaulters irrespective of their identity and status can be brought under legal provisions. Intelligence agency may work in garment industry area to avert further unrest and take preventive measure. Both public and private sector should work together to solve the problem of labor unrest. Level of mutual trust, communication and cooperation between the two sectors need to be uplifted. The implementation of above-mentioned recommendations is supposed to help address labor unrest in the readymade garment industry of Bangladesh. However, a number of issues relating to labor unrest in the garment industry of Bangladesh like industrial policy, labor relations, owner-worker relations, trust between public and private sector and conspiracy deserve further attention. Finally, as regards industrial relations in Bangladesh and, it can be said that despite a much smaller number of work stoppages in recent years, the industrial relations have been far from being sound. There were attitudinal problems of mistrust, multiplicity of unions, political affiliation of unions on deep ideological grounds, employer’s reluctance to part with information, their undermining the importance of unions and passing of laws, unions‟ failure to represent the interest of the workers but that of the political parties and overwhelming emphasis on third party settlement which has not proved too effective. The recommendation would be helpful to the practitioners, researchers, planners, policy makers and academicians, who are involved in the area concerned.